Abigail heart earrings by Elizabeth Cole. 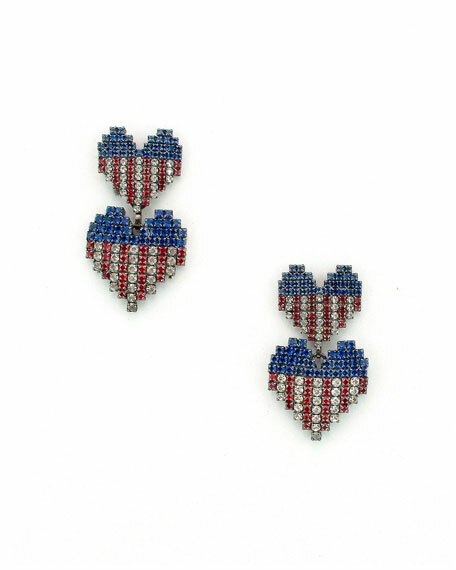 Red, white and blue Swarovski® crystals. EXCLUSIVELY AT NEIMAN MARCUS With every purchase Akola reinvests 100% of profits to empower women and families in poverty. Akola two-ring drop earrings. 18-karat gold-plated brass. Blonde horn and glass rings. Post backs for pierced ears. Approx. 3.5"L drop. Made in USA.